Despite what OkCupid profiles and resumes say, most people don't speak any foreign languages. In fact, they could barely say hello. 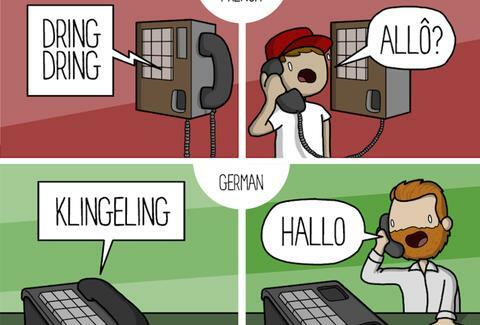 But now you can totally fake it by learning to answer the phone (yea, apparently, some people still make calls) in 10 different languages, thanks to this super-cool and informative graphic. Did you know phone ringtones are different in every language? It's true. And here you'll see that, along with how to pick up in Spanish, Russian, Indonesian, and more. No details on how to pick up actual Spanish, Russian, or Indonesian women, however. Check out the graphic, by cartoonist James Chapman, below, and impress all your dates with the little-known fact that in Germany, phones say "klingeling" when they ring.